Moving averages help us to first define the trend and second, to recognize changes in the trend. That's it. There is nothing else that they are good for. I won't be getting into the gory details about how they are constructed. There are plenty of websites and books that will explain the mathematical make-up of them. I'll let you do that on your own one day when you are extremely bored out of your mind! But all you really have to know is that a moving average line is just the average price of a stock over time. See also: How you can use moving averages to identify Elliott Waves. You can see in the chart above how these lines can help you define trends. On the left side of the chart the 10 SMA is above the 30 EMA and the trend is up. The 10 SMA crosses down below the 30 EMA in mid August and the trend is down. Then, the 10 SMA crosses back up through the 30 EMA in September and the trend is up again - and it stays up for several months thereafter. Focus on long positions only when the 10 SMA is above the 30 EMA. Focus on short positions only when the 10 SMA is below the 30 EMA. It doesn't get any simpler than that and it will always keep you on the right side of the trend! Note that moving averages only work well when a stock is trending - not when they are in a trading range. When a stock (or the market itself) becomes "sloppy" then you can ignore moving averages - they won't work! The 10 SMA must be above the 30 EMA. There must be plenty of space in between the moving averages. Both moving averages must be sloping upward. The 200 SMA is used to separate bull territory from bear territory. Studies have shown that by focusing on long positions above this line and short positions below this line can give you a slight edge. 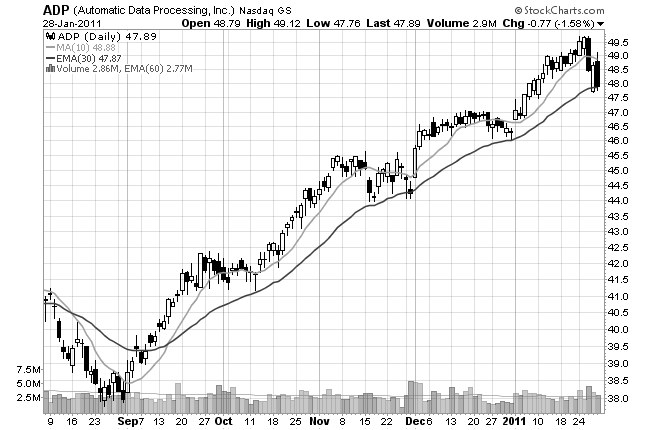 You should add this moving averages to all of your charts in all time frames. Yes. weekly charts, daily charts, and intra-day (15 min, 60 min) charts. The 200 SMA is the most important moving average to have on a stock chart. You will be surprised at how many times a stock will reverse in this area. Also, when writing scans for stocks, you can use this as an additional filter to find potential long setups that are above this line and potential short setups that are below this line. Contrary to popular belief, stocks do not find support or run into resistance on moving averages. Many times you will hear traders say, "Hey, look at this stock! It bounced off of the 50 day moving average!" Why would a stock suddenly bounce off of a line that some trader put on a stock chart? It wouldn't. A stock will only bounce (if you want to call it that) off of significant price levels that occurred in the past - not a line on a chart. Stocks will reverse (up or down) at price levels that are in close proximity to popular moving averages but they do not reverse at the line itself. So, suppose you are looking at a chart and you see the stock pulling back to, let's say, the 200 period moving average. Look at the price levels on the chart that proved to be significant support or resistance areas in the past. Those are the areas where the stock will likely reverse.